The town of Bar Harbor lies on the very scenic northeasterly coastline of Mount Desert Island, where it has become nothing short of a true tourism hotspot. 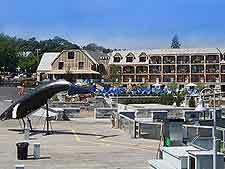 Each year and during the summer months, around three million tourists arrive in Bar Harbor, coming here to explore this historic town and its many old buildings, to sail around the adjacent Frenchman Bay, and the enjoy the frequent concerts staged during the Music Festival in July, and the Jazz Festival in August. 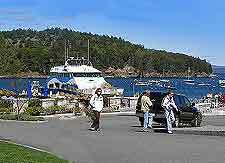 Bar Harbor provides the perfect base for entry into Acadia National Park, which covers a significant proportion of the island of Mount Desert and borders to the western and southern side of town. The Acadia National Park is another one of the reasons why this town has become so popular, affording endless recreational activities, woodlands, lakes, mountains and a huge amount of Maine wildlife. For tourist information, the Bar Harbor Chamber of Commerce on Cottage Street is the place to head, being open on weekdays only. Tourists will find that the main sights around Bar Harbor tend to relate to Mount Desert's beautiful coastline, with people traveling far and wide just to enjoy one of the legendary whale watching cruises, hoping to get close-up with a giant humpback whale. Hiking and walking is another popular pastime around Big Sur and many trails await within the Acadia National Park, affording views across mountains such as the Cadillac, the Champlain and the Dorr. Always popular with families is the Mount Desert Oceanarium, which features its very own Lobster Hatchery. 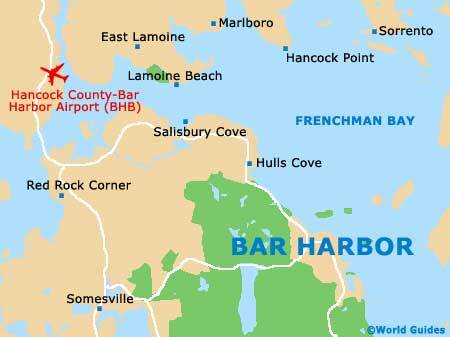 More information about Bar Harbor Tourist Attractions. Historical landmarks around Bar Harbor are in fairly short supply, and so those still standing are very much cherished by the local community. The Criterion Theater and Arts Center on Cottage Street is one of those sights, and dates from the early 1930s. 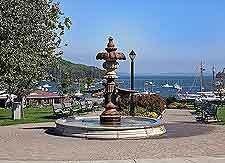 Also of note in Bar Harbor is the Village Green and its delightful Street Clock, and the wooden Town Pier, which is the perfect place to hang out in the summer months and boasts views of the Porcupine Islands. Close by, areas of Mount Desert's coastline are punctuated by pretty lighthouses, such as the Bear Island Light in Northeast Harbor, which dates back more than 150 years ago. More information about Bar Harbor Landmarks and Monuments. The native American heritage found in this part of Maine is explored within its selection of museums, where you will discover information about natural history and local culture. The Bar Harbor Historical Society Museum is worth a look, as is the Bar Harbor Whale Museum, which is particularly appealing to children and includes some enormous models and actual whale skeletons. Art galleries are also in good supply, being very much clustered on the Main Street, where highlights include the Argosy Gallery and the Native Arts Gallery. More information about Bar Harbor Museums and Bar Harbor Art Galleries. 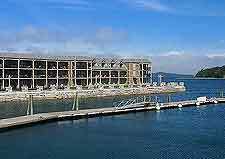 Bar Harbor is close to many further places of interest, both on Mount Desert Island and beyond, with the mainland being connected by a rather unobtrusive bridge. West of Bar Harbor and next to the Penobscot Bay, the bustling seaside resort of Camden is always busy, while rather more tranquil, Seal Cove on the western side of Mount Desert Island offers lengthy coastal pathways and a superb automobile museum. To the north, tourists will discover that the towns of Tremont and Trenton are both equally appealing, with nature preserves in Tremont and superb air tours available at Trenton, flying passengers directly above the Acadia National Park. 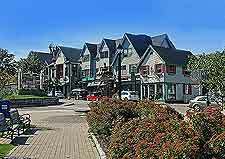 More information about Bar Harbor Attractions Nearby.